Is your E-mail open rate below 20%? Has most of your family unsubscribed? Do friends say things like, “I can’t get E-mail at work, but please do send me your literature by carrier pigeon.” Well, let’s fix that. Mistake # 1 — Not having a Subject Line or Title that grabs the prospect’s attention. The subject line or title is an ad for the rest of the E-mail. If the prospect does not find the subject interesting, they will not read the E-mail and they will not buy. You must grab hold of the prospect’s mind with a startling statement, a provocative question; some volley of words that will make them pay attention. Be careful though; outrageous statements make you look like spam. Stand apart by making a straightforward yet impressive claim. Mistake # 2 – Assuming that getting your prospect to read is enough. 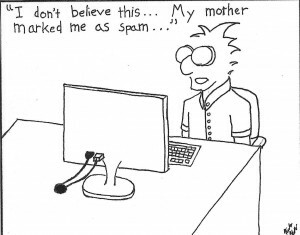 Simply stated, prospects (even your mom) does not really care about your product. Indifference is the order of the day. Capturing the prospect’s attention with a strong title is half the battle; you must hold onto it. And you do this by focusing on one of the fundamental urges which motivate people — fear, exclusivity, greed, guilt, the desire for love, beauty, health, wealth, etc. And these urges are based in the two prime human motivators; to avoid pain or gain pleasure. Your product must avoid or cure a pain or sate a pleasure. Mistake # 3 — Writing Your E-Mail For the Thousands of People You Will Be Sending It To Instead of That One Special Person. Another way to generate an apathetic response is to write for the group you will be sending it to. Approaching your E-mail with a “crowd mentality” instead of focusing in on a single, real, living, breathing prospect will impair the ability of your E-mail to make a genuine connection with the reader; it should read like one person sitting down writing to one other person. Mistake # 4 — Thinking Your Prospect Won’t Read a Long E-Mail. It is true that people read less than they used to, but they will read a long E-mail IF they are interested and IF you are selling something that needs explanation. Prospects will not read I-me-we or product oriented material. But offer the right product at the right price to the right audience and if you have enough to say and say it well enough, five-pages will pull more than two. Mistake # 5 — Not Offering Proof That Your Product or Service Does What You Say It Will Do. A. Customer Testimonials — A testimonial from a satisfied, well-known and respected customer is some of the most valuable proof you can offer. But make sure that the testimonial speaks to specific and relevant concerns that your prospect is likely to have. B. Tell A Success Story — We all know that stories sell. That’s because as skeptical as your prospect is, she is human. And humans are interested in other humans. Stories sell, in person and on screen. They sell because they give a prospect proof they can taste that your product will do what you say it will do. Your sales E-mail is the bits-and-bytes version of YOU telling that success story. Mistake # 6 — Not Being Specific. General statements of a product’s value slip off a prospect like water off a duck. You must give specific, verifiable figures of your product’s worth. Mistake # 7 — Not editing your E-Mail sufficiently. All writing – no matter how good or bad, can be made better by sharper editing. Good writing is good editing. Write as concisely as you can and use short words. Write with nouns and verbs; adjectives and adverbs are fluff. Any word that can be removed should be removed. Mistake # 8 — Being a Slave to Rules of Grammar. When writing a sales E-mail you want your work to have a conversational readability to it. That means writing in an informal style. Your objective is to generate a lead or advance or close a sale. Your “grade” will be determined by how well people respond. Mistake # 9 — Self-Aggrandizing. Your prospect is not interested in how great you think you are, they are interested in how you can help them avoid a pain or satisfy a pleasure. GOOD: Movie ads play to a captive, engaged audience and they may work for you depending on your product. GOOD: Reserved seating is the future of any profitable theater, if you don’t offer it, your competition will. Customers will then have a choice between sitting where they want or being treated like one of the herd. Which theater would you go to? I hope this article is proof. If you are reading this far you have already read over 1000 words. I’ve edited this piece dozens of times and it could be improved with more editing. This is hard for myself to show as I seldom make grammar errors. I don’t think this article is self-aggrandizing, but that’s for the reader to decide. Don't miss a single tip on how to run your theater better. Sign up to get notified when there is a new posting of Notes from the Edge.